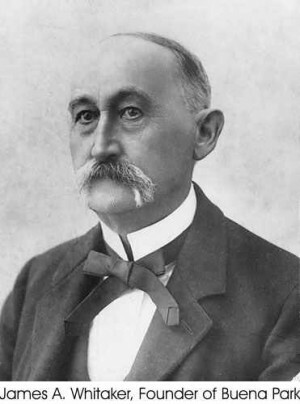 Buena Park was the creation of James A. Whittaker who, in 1887, purchased 690 acres and recorded the townsite. Whittaker was a successful grocer from Chicago who wanted to establish a cattle ranch. Santa Fe Railroad officials encouraged him to develop a town near their tracks instead. The little town, which Spanish settlers referred to as “plaza buena” or “good park”, took root and began to grow. 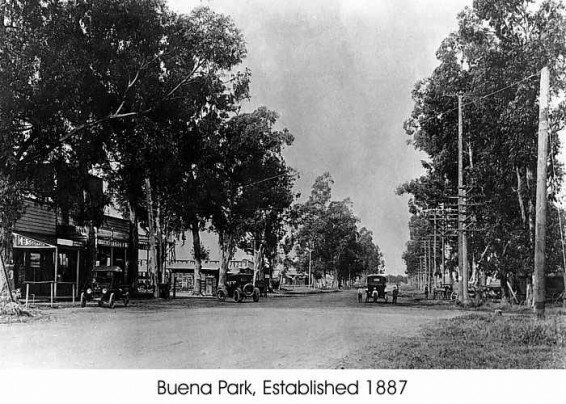 Buena Park first became known as a dairy center, and both the Sante Fe and Southern Pacific railroads built depots. The Lily Creamery started operations in Buena Park in 1889. 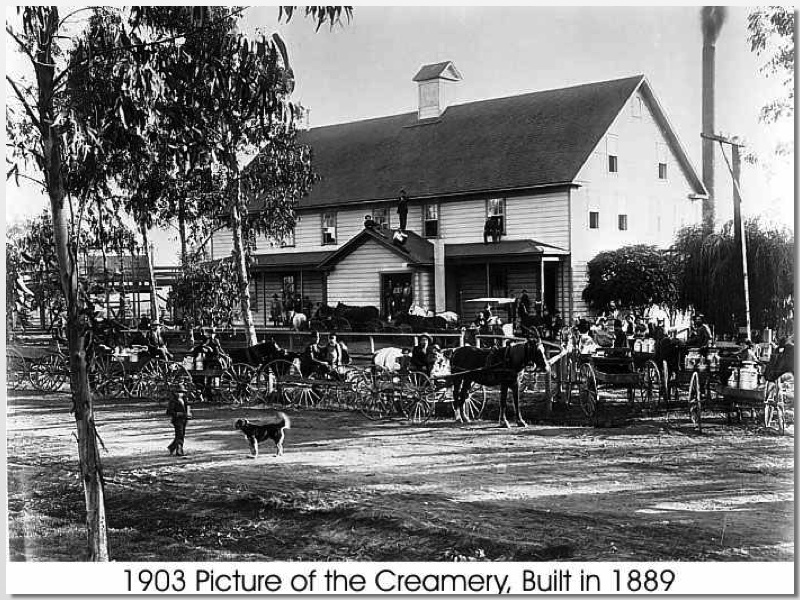 With the exception of a few wineries, the creamery was the first industry in Orange County. 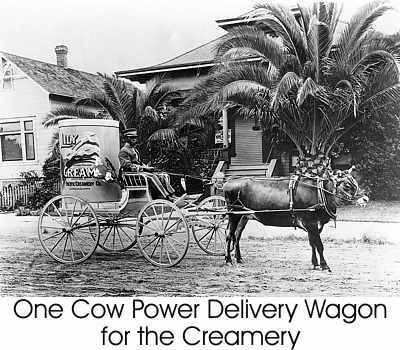 Lily Creamery had a wagon with a replica of the can on the back, pulled by a Jersey cow, that made local deliveries. Later pictures showed the word CREAM had been changed to MILK. This was forced by the federal government because the product was actually condensed milk instead of cream. The creamery, which helped develop many dairy farms in the area and was responsible for the growth of Buena Park, closed in 1907. The building was later used as a vegetable cannery and was eventually torn down in the mid-1950’s to make way for the Santa Ana Freeway. But a new signature business was on the horizon for Buena Park. In 1920, Walter and Cordelia Knott moved to town and began farming on Highway 39 (now Beach Blvd.) They grew rhubarb, asparagus and berries which they sold at a roadside stand.In 1928, Cordelia opened a little tearoom where she could sell her homemade jellies and jams. In 1932, a family friend named Rudolph Boysen tried to cultivate a new strain of berry, but the vines wouldn’t grow. 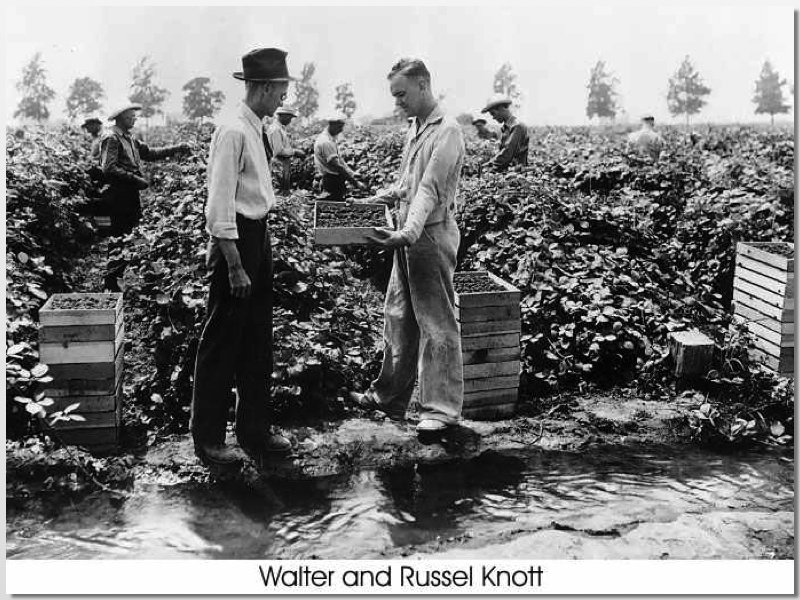 Walter Knott took the failing plants and nurtured them to health. He named his new berry – a cross between a raspberry, a loganberry and a blackberry- the “boysenberry” after his friend. Mrs. Knott began serving homemade biscuits and fried chicken dinners in her tea room. Word spread about Cordelia’s delicious dinners and boysenberry pies. Soon, there were long lines of customers, hungry for more. So Walter Knott built a little Ghost Town attraction near the restaurant, to entertain visitors while they waited for a table. 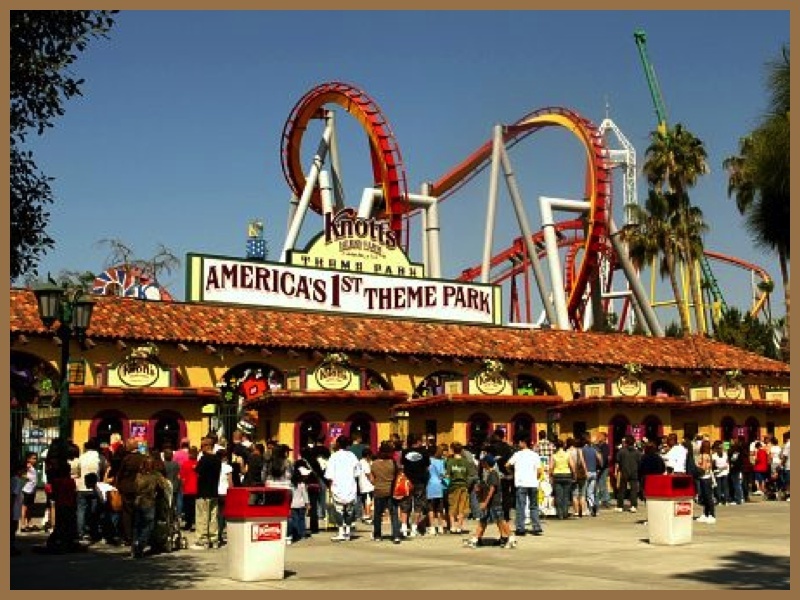 Like other Knott creations, it was a huge success and Knott’s Berry Farm, America’s first theme park, was born. The City of Buena Park calls itself “The Center of the Southland. While that designation may be geographically nebulous, there is no doubt that this city on the northern border of Orange County is the region’s center of tourist and entertainment attractions. Sure, neighboring Anaheim has Disneyland, but Buena Park has a whole entertainment zone with a wide variety of family-oriented fun. Buena Park has come a long way since Walter Knott built his small ghost town behind his wife’s chicken dinner restaurant. Knott’s Berry Farm is now a major theme park attraction with over 30 rides. You can still pan for gold at the old Ghost Town, but now you can cool off afterwards at Soak City USA water park next door. But Knott’s Berry Farm isn’t the only game in town. 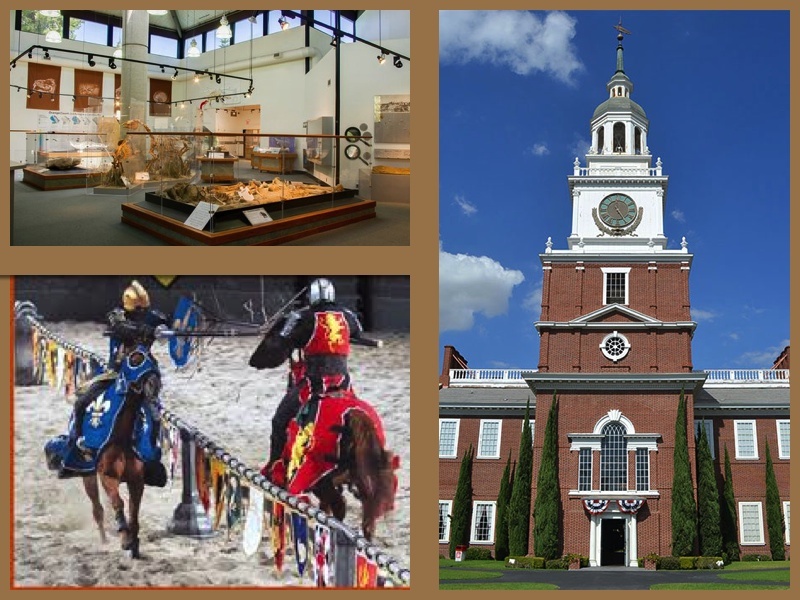 Buena Park offers several unique dining options including interactive dinner shows like Pirate’s Dinner Adventure and Medieval Times Dinner & Tournament. Buena Park isn’t all about fun and games. The city has preserved several of its historic buildings from the 1800’s and offers free tours of the Whitaker-Jaynes Estate Park. Knott’s Independence Hall is a true brick-by-brick replica of the original in Philadelphia. If you’re idea of history is the prehistoric kind, The Los Coyotes Paleontology Museum, located in Ralph B. Clark Regional Park, features ice age fossils and local geology exhibits.